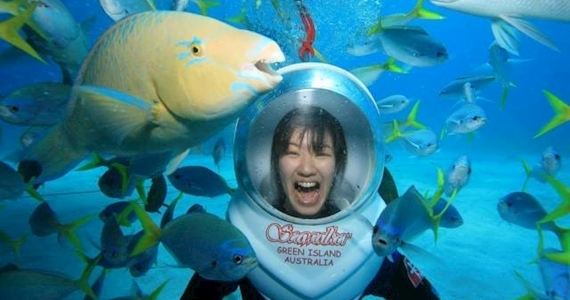 Walk along the Sea floor at Green Island Australia, the best way to see the Great Barrier Reef and marine life. Seawalker (helmet diving) is quick, easy, and there’s no need to learn how to use complicated equipment. No experience is needed, and because you walk on the smooth, clean sand of the sea floor, it’s perfect for non-swimmers or anyone else who might not be confident in water!